FORT MEADE, Md. — A newly appointed judge refused on Monday to step down from the case of the Guantanamo Bay detainee accused of orchestrating the 2000 bombing of the USS Cole in Yemen, dismissing defense arguments about possible conflicts stemming from an earlier case. Kammen questioned whether Spath could be an impartial judge in the trial of Abd al Rahim al-Nashiri, since al-Nashiri also faces a possible death sentence if convicted. A member of al-Nashiri’s defense team is assisting in Witt’s appeal, Kammen said, calling that another potential conflict. Monday’s pretrial hearing in Cuba was the first before Spath. The Associated Press covered the hearing by watching a video feed at Fort Meade, near Baltimore. Spath told Kammen he had “gone through what I would call a struggle” with capital punishment but had not come to a personal decision about its fairness. “I don’t have a personal opinion or a bias in my mind one way or another,” he said. Kammen also probed Spath’s attitudes about torture and Islam. Al-Nashiri is Muslim. Kammen asked Spath if he would consider as a mitigating circumstance evidence that a defendant had been tortured or abused. Al-Nashiri was held for several years in secret CIA prisons. A CIA inspector general’s report says al-Nashiri was subjected to waterboarding, an interrogation technique in which drowning is simulated, and threatened with a gun and power drill. Prosecutors cannot use evidence obtained by coercion. The hearing is scheduled through Friday. Other motions to be argued include a defense request that the judge set a deadline for prosecutors to turn over documents detailing al-Nashiri’s treatment by the CIA. The defense also wants the judge to order an MRI brain scan of al-Nashiri to look for evidence of traumatic injury. Defense lawyers also want the government to disclose the method it would use to execute al-Nashiri, if he is sentenced to death. Left: Air Force Col. Vance Spath has said a 2005 case he prosecuted has no bearing on his thinking in the case of the Guantanamo Bay detainee accused of orchestrating the 2000 bombing of the USS Cole in Yemen. 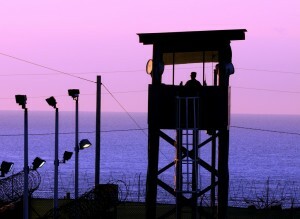 GUANTANAMO BAY, Cuba. Photo by the National Guard.